Currently, our understanding of the population that needs and uses long-term services and supports (LTSS) is largely derived from studies of people age 65 and older. However, nearly half of all individuals with functional needs are adults younger than 65. This younger population has a wide variety of disabilities and LTSS needs. 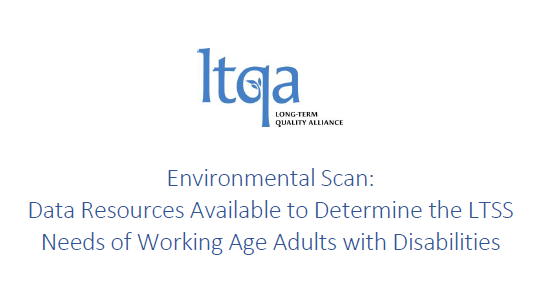 The Long-Term Quality Alliance, with support from The Commonwealth Fund, conducted an environmental scan of the data resources available to understand the scope, need, use and cost of long-term services and supports (LTSS) by adults under the age of 65 in the United States. This environmental scan was designed to describe the information that is available to understand these needs and to identify its limitations. The scan is part of a process intended to lead to recommendations for research priorities that will generate the information needed to support improvements in LTSS for adults under age 65 with functional needs. Current national surveys provide little detail on adults under age 65 with disabilities or the nature of their disabilities, and almost no data on LTSS needs or service use. Recent trends are moving away from collecting useful, detailed information on disability and LTSS need. Data on the LTSS needs, service use, and cost for adults under age 65 with disabilities is inadequate for numerous reasons. There are many questions about the LTSS needs of adults under age 65 with disabilities that cannot be answered by existing data sources. Much more data is still needed. Click here to read the complete environmental scan.